We'll take over a lush secluded retreat center for 6 days & nights of making art, nurturing relationships with other women, and adventuring in the jungle paradise of the Nicoya Peninsula in Costa Rica. Our group will lodge in a private villa compound with our own pool and secret path to the beach surrounded by jungle, falling asleep to the sound of the surf. Each morning I'll lead us on a nature mandala walk to the beach to begin our day. Mati Rose McDonough and I are teaming up to take you on a layered painting adventure! After a delicious fresh breakfast served by our in house cook, each morning we'll dive into lessons on our gigantic open air porch filled with hammocks and comfy couches. We'll lead you through collage, working with stencils, silk screening, spray painting, gold leafing, layering with drips and washes, incorporating geometrics, and creating abstract layers along with painted Mandalas and Feather Power Girls! At the end of our time together you'll leave with 3 finished paintings and tons of new skills under your belt to invigorate your painting practice back home! daily painting lessons by both Faith & Mati…using our jungle beach location for inspiration we’ll dive into mixed media layered goodness with lessons in creating abstract paintings through a variety of marks and materials to express natural space and tropical inspiration. Through a slow build up of process you’ll create three 16 x 20 inch paintings in our open air studio. Mati and Faith will lead you through lessons in collage, wash painting, stenciling, silk screening, spray painting along with painted mandalas and feather power girls. You’ll come away with work that you love, and lots of new ways of seeing and working, to take home to jump start your own studio practice. a gift bag full of goodies & gifts for you to use in your art making, along with a collaborative original painting made by Faith and Mati! most of your art supplies, paints, silkscreens, stencils, brushes, including three 16 x 20 inch canvases for each person. If you have favorite supplies from home we ask that you bring those along! free day for horseback riding, zip-lining, massage, surf lessons, local wildlife tours, fishing and jungle hikes. lots of free time in the afternoons to explore the local beauty, nature preserve, and nurture relationships with other creative women. a short distance to Nosara, a funky, holistic, hip enclave in the jungle, with cute restaurants, juice bar, shops, spas and yoga. Also as a bonus gift for our lovely retreaters: ~You'll receive a FREE year of access to 52 Paintings: A Year of Joyful Self Discovery and Community Through Painting; the year long online painting class with Faith & Mati (a $1200 value). Due to popularity this retreat is already sold out! Please join our mailing list to get up to date information for our Pura Vida Costa Rica 2017 Retreat! The Jungle Beach House has its own private walkway to the beach (1 min. walk) so falling asleep to the sounds of surf is a definite. This large property is very private, lushly landscaped and has a swimming pool, covered parking (for rental cars if you decide to rent one) and many great features. The primary gathering area is in the oldest building, the Rancho, a rustic rancho open to the outdoors with soul. It has a gigantic open air porch with a soaring gthatched roof which will become our own large jungle studio space for the length of our stay, complete with hammocks and comfy couches, a living room, two dining areas, convenient bathroom and a large kitchen. 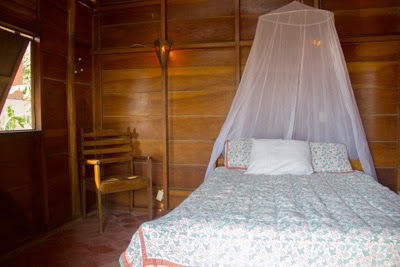 Finally, there is the Main Guest House which has four air conditioned bedrooms. 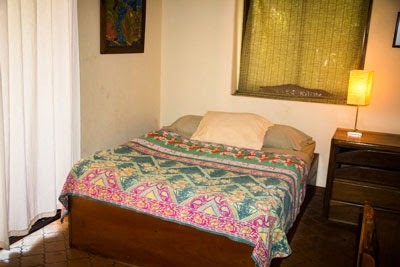 Two of the upstairs bedrooms include private, rustic balconies that overlook the grounds. Check out our Pura Vida video!